Anyone who has been to the Gawker Media offices in New York’s SoHo district has been greeted by a graphic reminder of how important traffic numbers are to the company — namely, the giant screens that list the top hits of the day. In a new memo, however, Gawker founder Nick Denton says that is going to change: no longer will traffic be the only benchmark of whether a story has done well. Now, editorial judgement will also play a role. When it comes to generating raw traffic, Denton admits, BuzzFeed has effectively won the war. Although Denton’s memo downplays these changes, they are both fairly significant. Just over a year ago, in a different memo (leaked, as usual, by Denton himself), the Gawker founder was declaring war on BuzzFeed — which passed Gawker in terms of monthly unique visitors in November of 2013, with 130 million — and earlier this year the site vowed to hire more staff so that it could compete with its “smarmy” uptown rival. In the latest missive, however, Denton says that Gawker has “reached the limit” of the traffic-focused approach, and that the value of posts will now rely in large part on the views of his new editor-in-chief Tommy Craggs — the former Deadspin editor who replaced Joel Johnson at the top of the Gawker editorial heap. According to Denton, Craggs will be featuring posts he likes on a company-wide blog with the tongue-in-cheek name The Politburo. As Denton notes in his memo, Gawker was one of the first blog network/media players to focus almost completely on traffic as a measure of value, and even for a time based the compensation of its writers in part on how many high-traffic posts they had written. Even after that stopped, traffic was still king: the site even hired a writer specifically to generate viral hits — Neetzan Zimmerman (who later left to join Whisper), who was in some months single-handedly responsible for as many as 15 million unique visitors. These are just the latest changes in what has been a period of upheaval even for Gawker, an entity known for its love of turmoil and drama: In addition to Johnson leaving, Denton has turned over management of the network to a committee of editors. While that might look bad in any other company, one of the unique things about Gawker is that Denton controls the entire thing, and so his opinion is the only one that really matters. If you want traffic, you just go to Reddit or Imgur and grab whatever’s gaining traction there. That’s a lot of what Buzzfeed does, and what that viral writer for Gawker did too. But it’ll turn your site into Reddit-content + listicles + clickbait + ads and sponsored content. Not a very dignified end result. That’s stuff that interns can do for you. The thing about Gawker I like best is the editorializing. Nolan, Scocca, Juzwiak, etc. Don’t take it hard Nick, Facebook really opened up the flood gates for Buzz Feed it seems while us smaller publishers suffer. The only Gawker site I ever visit is Lifehacker. A couple of years ago I even stopped going there. I just could not stand the link bating sensationalized headlines Gawker site were using. Only time will tell whether they have turned over a new leaf or not. 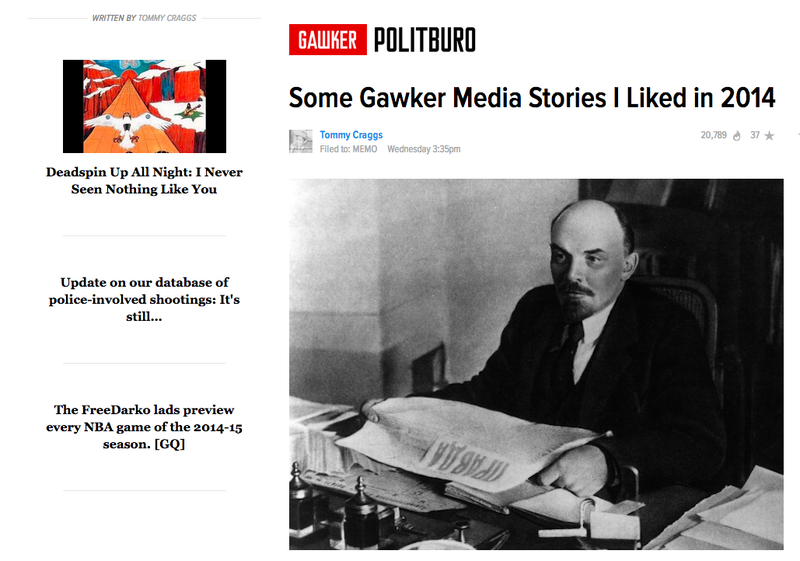 We will see if the old saying “A Leopard can not change its spots” applied to Gawker media. Regarding the kicker, “his opinion is the only one that really matters”: if he’s a good manager (which I am believe he is) this cannot possibly be the case. Nobody makes good decisions in a business vacuum. Scientific studies have proven that your IQ drops every time you click on a link that leads to BuzzFeed…Gawker isn’t much better, so nice to see them recognize that and start moving back towards credible news instead of link baiting garbage. With the corresponding announcement at Discovery that Mermaids and Snakes eating Men are out, we could actually see the start of movement back to news and shows that actually inform and educate rather than just entertain…not holding my breath, but hopeful.